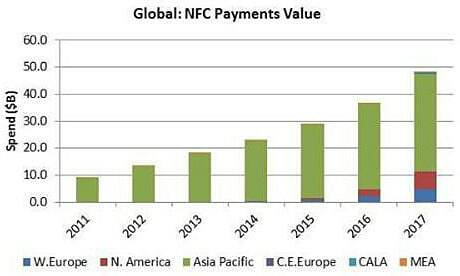 The analysts now forecast that 115 million NFC handset owners will spend just over US$48bn using their NFC phones in 2017, down from 158 million and US$53bn in its previous forecast. “The healthy growth in sales of NFC handsets has yet to be matched by the adoption and use of handset based NFC payments services, with many mobile operators pushing back the launch of NFC-based mobile payment into the final quarter of 2013 or into 2014 and beyond,” NFC Mobile Payments Forecast Update: 2013-2017 warns. “With the exception of China, where we see some momentum from China Mobile deploying its mobile wallet service, fewer mobile operators than anticipated launch NFC payment services in 2013,” says Nitesh Patel, director of Strategy Analytics’ wireless media strategies service. “The prospect of both Apple and PayPal launching alternative mobile payment solutions based on Bluetooth Low Energy, not NFC, and increasing interest in dynamic QR codes from PayPal, adds further uncertainty to the role of NFC in supporting in-store mobile payments,” adds David MacQueen, executive director of media and apps at Strategy Analytics.